The line consists of two bleaches in cream and CREAM_B CREAM_V, which ensure maximum protection in the stunning blonde. Lets get lightening uniform, light to heavy, up to 5 tones. 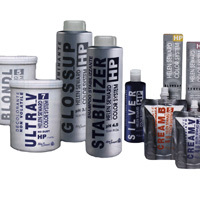 It is ammonia-free for bleaching delicate in maximum comfort. A whitener from the enhanced anti- yellow, which lightens up to 7 tones. Thanks to the high performance micro purple pigments, the blond is uniform and perfect, with maximum protection.